Richard Zeppieri as Tony doesn’t need to point fingers to show he may just be the smartest man in the room in Kat Sandler’s locked and loaded comedy that gets down to business in Bang Bang on stage until February 18, 2018. It’s been said that 1,000 deaths is a statistic but that a single death is a tragedy. 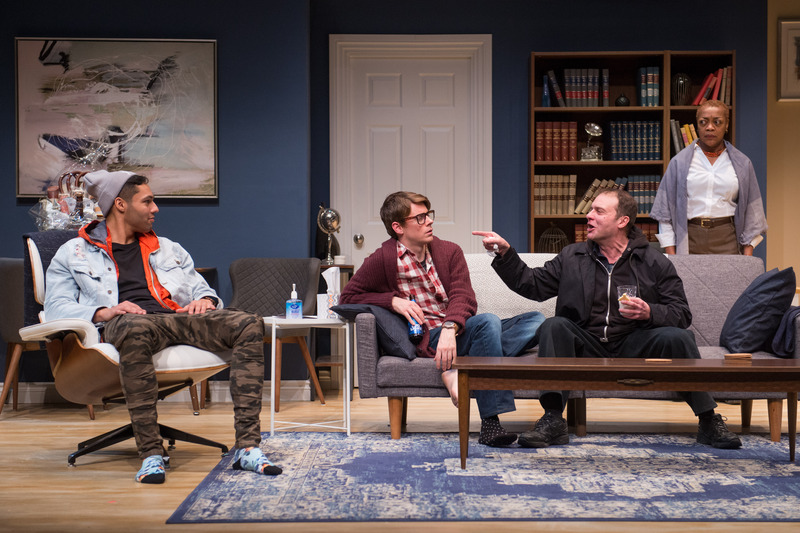 With the hot topic of gun violence dominating our daily newspapers, how does a playwright weigh into the issue with sensible examination of truths in an entertaining and engaging fashion? Kat Sandler proves she knows where to find the emotional trigger in a story that’s funny, fierce and downright fabulous. As director of this season’s sleeper hit, she sets her highly amusing allegory in a cozy contemporary setting to make playgoers feel right at home. Her central character, Lila (Khadijah Roberts-Abdullah), is a 30 year old ex-cop who lives at home, has no job and no friends as a result of a police shooting involving a an unarmed suspect. On this day in particular, Tim (Jeff Lillico) an awkward playwright that’s made a wheel barrow of cash from an inspired version of her story pays her a visit to get answers. And to announce that big screen version of his box office hit is on the way. Oh yeah, and to give her a heads-up that the star of the movie, Jackie (Sebastien Heins) is also on his way to gain insight into her motivation for the ‘complex and complicated’ character that will be portrayed. Tense and thunderous at times, satirically blissful at others, Bang Bang is masterful in this Dora Award nomination worthy production that doesn’t miss its humorous target.